A foldable phone by Samsung is pretty much guaranteed. The company is not really being secretive about it and president of Samsung Mobile DJ Koh has discussed the project openly a few times. Of course, we don't know how it's going to look and how it's going to operate exactly, but we have a couple of solid leads. All of the current information points to a clamshell-like design, where the phone will have a large display on the "inside", and a smaller, 3.5-inch-ish screen on its outer shell to show you notifications and whatnot. Oh, also, it'll cost something like $1,700 or $2,000. You know — ballpark, nothing concrete yet. So, a lot of people are pretty vocal about not caring for a foldable phone. At least, not with our current technology and not one that's going to cost an arm, a leg, and a few kidneys. But, on the other hand, being among the first to own Samsung's very first foldable phone would definitely be cool. Which side of the fence are you on? Will you be buying the foldable Galaxy F when it launches or are you going to wait for a few generations before even considering it? Do you plan on buying the foldable Galaxy F? If the device can fold like that of the concept shown above with no spring hinge, then yes it will be interesting. And with inferior display and half the functions. Ditto on the Pie for the Note 8 request. Shouldn't there be an option to wait and watch , like most other polls ?? Option C: Let me first handle it a bit to take a decision. Not voting because ther options don't apply to me even as a Samsung fan. I need to be sold on the value first. So far not seeing it. Ditto. Plus the "No, no, and — let me thing about it — no" option not only has a typo but is quite unnecessary. Until we actually see the final product, this poll is pointless. 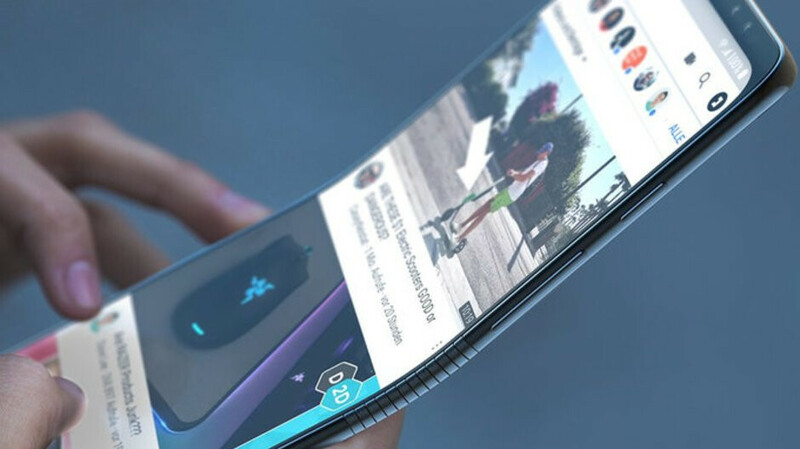 I've gotta say that I'm very interested, but I don't think foldable phones are practical as of now. I also think that it is WAY too early to be posting a poll about this device yet without details from Sammy. let me "thing" about it? Needs to have more options in the poll. Like we will see what it looks like and how it works. How much is it. Yes or no is stupid options. I am definitely interested in the phone. But I am not a for sure either way. It's all about the price! If they can get the price down to something reasonable I'm on board; otherwise, the S10 looks pretty good! Just wait 3 months for every Chinese company to release an exact replica for half price. The thing about it is I don't need to "thing about it"....No. It need a specific use case. I personally don't need to unfold my phone each time i try to use it. I also prefer a large flat phone in my pocket than something at least twice as thick. This design doesn't solve a problem that I have. There are many great uses for a foldable device, but I doubt phones will be the primary use of this technology. Maybe Apple could get away with it. They made the notch popular so i guess even pigs can fly (in an extremely dense atmosphere). How can I answer without seeing the actual device? lol let me thing about it. Buy a foldable phone that would be running on Android for $1700? I definitely would pass. Though I can't afford it but it's still Android like poco. The awe moment will die in a months time and what do I get to show for it? If it's anything like the Note 9, you get the best smartphone available. This phone isnt designed for an everyday consumer, nor will it ever be priced for one. It's designed for people who need what appears to be a phablet, that will offer PC-like functions on the go. Which means its basically for people similar to Note users. I expect most will not buy a device like this. It's pointless to even have such a poll. I'm not concerned about cost, I'm concerned about features. If it's just a folding Galaxy Note with DeX, then I wont be buying. However, if it has the newest ARM chip from QC, and has 6GB+ of ram, then I can install a VM on It and Run Windows 7/10 and if it includes a stylia; i will most certainly consider it as a Surface replacement. I'm very interested, and excited for the potential, but not sold on it yet...not at that price. So option 'C'? The folding screen will be extremely prone to scratching. Zack at JerryRigAnything will have to invest in some lower number Moh's hardness picks when he tests this one! I'm sure it will use the same gorilla glass found on the Note and other Samsujg phones. I mean for what they plan to change for it, what makes you think they are gonna cheap out? This is Samsung, not Apple.